Portugal, in my personal opinion, is one of the best “value” countries in Western Europe – in other words, it isn’t necessarily cheap, but you get a lot for your money. Good food, great wines, scenic coasts and lovely cities. There’s a lot to choose from, but you’ll no doubt want to include Lisbon as part of your trip (if for no other reason than it’s the most convenient airport/entryway). 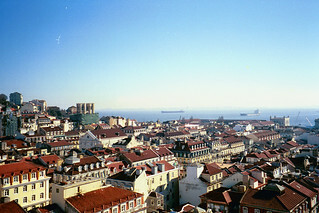 Lisbon is a capital city so even though it’s good value, several days here can add a lot to your overall travel budget. Here are a few personal suggestions for making the most of it, all on the cheap. Portugal has some great wines, and actually many of their most unique wines aren’t heavily exported, so you might not realize the extent of their production. A great place to get an educational overview is Lisbon’s Sala Ogival, a FREE wine tasting room on the beautiful Commercial Square in central Lisbon. You can do a whole tasting around, complete with tasting notes and local experts on hand for tips and suggestions. I also like the huge map which shows you the wine growing areas all around the country. The only danger here is that all the wines available for tasting can also be purchased. Whoops! Sunday is the free day in Lisbon, and while the museums will be busy, it’s still free – always a good deal. The famous Gulbenkian Museum is open most Sundays for free all day, but you’ll want to visit some of the other museums first which are typically free from 10-1ish. The problem is that you can’t possibly cover more than 1 or 2 museums in that time frame, so you’ll need to pick and choose wisely. Perhaps you can stick to one area or make two choices that are fairly close together – for example, the Belem area has quite a few museums. You should probably get up early and enjoy some strong coffee and some sugary pastries from one of the popular local cafes before your museum run. I love the views walking up to the Castelo de São Jorge. There’s a charge for the castle, but not for the many terraces along the way. The Santa Justa elevator is very photogenic, and the stairs are more interesting than taking the lift. Many of Lisbon’s beautiful churches are open without admission fee. If you see a building that looks interesting, just pop in and say hello – just be respectful of any service going on. How do you get around Lisbon on the cheap?